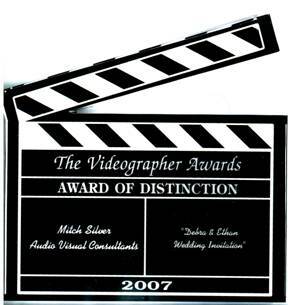 AVC’s staff editor, Mitch Silver, won the 2007 Videographer Awards “Award of Distinction” for the wedding invitation video he produced. Mitch met with clients Debra and Ethan to determine their interests and to plan the shoot that took place at the nearby Rose Garden. Mitch applied some fun effects during editing and posted the wedding invitation to YouTube. See it here. AVC produced both an online version and a DVD version. The DVD became incorporated in the printed invitation sent out to guests. Debra and Ethan were married May 27, 2007. The Association of Professional Videographers (APV) gave this award to AVC for a documentary video we produced for Starr King School of the Ministry on what it takes to become a Unitarian minister. Former AVC post production manager, Jason LaBatt won this award for AVC for the creative editing he did with a wedding video highlights DVD. In one scene, Jason was able to combine both the bride’s and groom’s vows together so they are speaking in unison. employer Ravenswood Hospital in Chicago.